On February 23 your dog doesn’t want a pat, to be scratched behind his ear, or to run after a stick. What he really wants is his biscuit because it’s National Dog Biscuit Day! This day is also known as Dog Biscuit Appreciation Day. It’s the best day of the year for dogs. It’s also a day to pamper your pooch because he deserves it. After all he’s your best friend. So, give him his favorite biscuit, or even better- stock up on his favorite treats. The largest dog biscuit weighed 279.87 kg (617 lb) and was made by Hampshire Pet Products (USA) in Joplin, Missouri. The first bone shaped biscuit for dogs appeared in America and the shape caught on! The first large-scale manufacturer of dog biscuits was a man from Ohio called James Spratt who traveled to England and produced these biscuits. It was around this time that dog biscuits were produced in England on a small scale, though dog-bread had been around for ages. Let him have as many as he likes. It's a special day after all! When you make your own you can control and ensure that the best ingredients go in. They'll be healthier and cheaper. Why not!? A plateful of biscuits and some room to run in the yard with other dogs -- that's all that your dog needs. A butcher in England in the 1800s was trying a new recipe for biscuits that turned out to be terrible. He gave one to his dog who loved it. The rest is history! Before we had dog biscuits, dog bread was a popular snack given to canines. What happens if you eat a dog biscuit? If you ate a little bit of dog biscuit nothing would happen, its edible! But eating too much might make you sick, as dog food doesn't have the same strict safety regulations as human food. Louisiana Alligator Dog Biscuits' name says it all! They are made from alligator protein. They even make alligator jerky. Biscuits and other snacks should only make up 10% of a dog's daily calorie intake or dogs can become overweight! Dogs love their biscuits. Some like it with bacon, others with peanut butter and a few even like pumpkin! This is just another way to show our appreciation for our dog or reward him for good behavior. 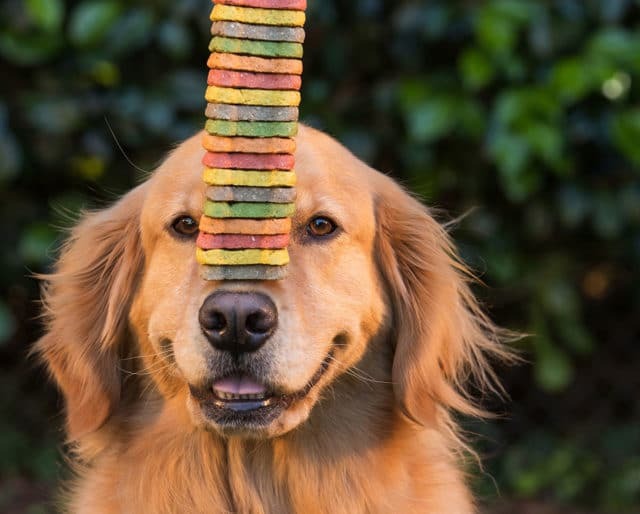 Select the right variety of biscuit and it can be a very healthy snack for your dog!